LONDON – Governor Robert Bentley addressed a group of Alabama economic development and community leaders at a breakfast this morning that kick-started the state’s job-hunting mission at the Farnborough International Airshow. Governor Bentley is leading the Alabama delegation at the air show, where officials from around the world connect with aircraft manufacturers and suppliers to talk business. The biannual event held near London is one of the most important events on the global aerospace calendar. “We’re here to try to get jobs for the great state of Alabama,” he told the group. After the event, he said Alabama’s aerospace industry is primed for growth as project activity heats up following a productive 2015, which brought in nearly $500 million in new capital investment for the sector. The governor said he will join the team from the Alabama Department of Commerce, led by Secretary Greg Canfield, in discussions with aerospace executives at Farnborough on Monday. “During the air show, we have meetings scheduled with some of the biggest companies in the industry, and we’ll talk about how Alabama can be part of their plans,” he said. Governor Bentley, who has attended previous air shows in London and Paris, said the Alabama economic development team has been able to build relationships at the aerospace trade events that have produced new investment and new jobs for Alabama. 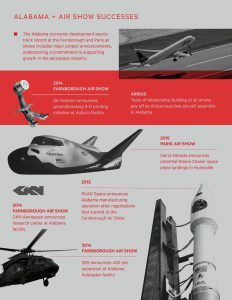 “The successes recorded by the state’s economic development team at recent air shows in London and Paris demonstrate that Alabama is a force in the aerospace industry,” Governor Bentley said. Secretary Canfield told the group that aerospace is a key target sector in Accelerate Alabama, the state’s strategic economic development growth plan, and the second busiest sector in terms of recent project activity, behind only automotive. Mike Lanier, president of Birmingham-based Hoar Program Management, told the group that momentum is building for continued growth in Alabama’s aerospace industry. “We’ve got a great story to tell now that the Airbus manufacturing facility is up and running, in addition to all of the other things we have going in aerospace and aviation,” Lanier said. HPM, which sponsored the breakfast, managed the construction of Airbus’ $600 million A320 Family aircraft production center in Mobile. Airbus launched production last year and delivered its first Alabama-built passenger jet to customer JetBlue in April.